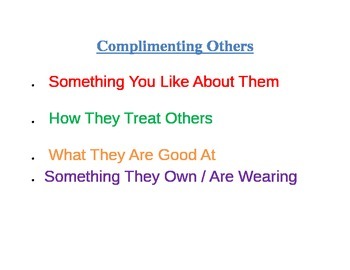 I used this game for my 6th grade social skills group to teach the kids about complimenting others. We first talked about why it is important to give and recieve compliments, such as strengthening a friendship, making someone feel better who is having a bad day, or recognizing someone else's effort. We also talked about how there are several different types of compliments such as about personal characteristics, how people act, and what they own. Then the kids each picked a few different color goldfish (you could use M&Ms, skittles, or even colored paper if you dont want to use food) and practiced giving eachother compliments that matched the color goldfish they had. For example, if student A had a green goldfish the other students went around gave examples of times they saw him helping others in school. Afterwards, we talked about how it felt to give and recieve compliments from their friends and how they should try and give compliments to others throughout the week to see how they felt and how they could affect others.